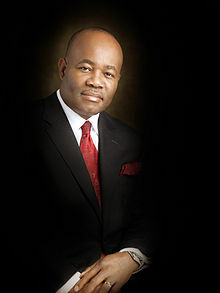 The Economic and Financial Crimes Commission has begun investigation into alleged theft of N108.1billion of Akwa Ibom funds by former Governor Godswill Akpabio. The action followed a petition forwarded to the commission by an Abuja-based lawyer and activist, Leo Ekpenyong. Mr. Ekpenyong had on June 8 petitioned President Muhammadu Buhari and the EFCC, calling for Mr. Akpabio’s probe and accusing him of looting Akwa Ibom state treasury. Investigations by PREMIUM TIMES showed that several other indigenes of the state who have demanded the investigation of the former governor, have been invited by the EFCC to adopt their petitions. On his part, Mr. Ekpenyong was summoned on Wednesday, June 17, to adopt his petition and provide more details to some of the allegations he made against Mr. Akpabio. The former governor, now senator, was elected in 2007, at a time the nation enjoyed robust oil revenue. Akwa Ibom State and Rivers State are Nigeria’s largest oil-producing states. The two states alternate as first and second top producers periodically. The two states receive the highest funds allocation from the Federation Accounts Allocation Committee, FAAC, monthly. Data from the National Bureau of Statistics and the office of the Accountant General of the Federation indicate that under Mr. Akpabio, known for ostentatious spending, Akwa Ibom received a staggering N1. 6 trillion from FAAC between June 2007 and May 2014. At the time he vacated office on May 29, the state received more, excluding other revenues like Ecological Funds, internally generated revenue etc. In a new petition to the EFCC dated June 22, and copied to Mr. Buhari and the Inspector General of Police, Solomon Arase, Mr. Ekpenyong gave details of some of Mr. Akpabio’s alleged financial recklessness. He indicated that between January and December 2014, the ex-governor colluded with two of his top aides to steal a whopping N108.1 billion from the state’s treasury. Mr. Ekpenyong told the EFCC that the former Government House Permanent Secretary, Etekamba Umoren, and the former Accountant General of the state, Udo Isobara, colluded with Mr. Akpabio to steal the funds. “Between January –December 2014, it is on record that the trio of Godswill Akpabio, Mr. Etekamba Umoren and Mr. Udo Isobara, made illegal but substantial withdrawals of cash from a designated state government-owned account with Zenith Bank with account number: 1010375881 amounting to N22.1 billion,” he stated in the petition. For assisting Mr. Akpabio retire billions of the stolen funds, Mr. Ekpenyong said Mr. Umoren was rewarded with an appointment as Government House chief of staff and now secretary to the state government under Udom Emmanuel’s administration. The legal practitioner went on to state that over N50 billion of Akwa Ibom funds were spent by the former governor during the last general elections. During the period under review, he said Mr. Akpabio also withdrew a whopping N18 billion from the state coffers under the guise of special services, reception of very important guests and sundry items. “The cumulative aggregate of these monies stolen by Godswill Akpabio from the coffers of government as pocket money is the annual budget of some states in Nigeria put together,” the petition reads. He listed the bouquet of assets acquired by the former governor through surrogates to include a multi-billion naira mansion at Plot 5 Okogosi Spring Close, off Katsina-Ala Crescent, Maitama-Abuja, a multi-billion naira mansionette at Plot 28 Colorado Close, Maitama, Abuja and another multi-billion naira mansion at 22 Probyn Road, Ikoyi, Lagos. billion naira 25 storey building at Akin Adesola Street, Victoria Island, Lagos. “As earlier promised, more details of assets and graft-related funds illegally and fraudulently siphoned from Akwa Ibom State treasury and laundered to foreign destinations are in the offing. As usual, we will do the needful. An EFCC source said senior officials of the commission held discussions with Mr. Ekpenyong on the petition on Tuesday. “He also adopted the petition he forwarded to the commission and provided additional details about the alleged stealing of funds by the former governor,” the source said. The source noted that many of those who have sent petitions to the commission against the former governor, now senator, have already been invited to adopt their document. He confirmed that very soon the commission would invite the former governor for questioning. Mr. Akpabio could not be reached for this story. Messrs Umoren and Isobara could not also be reached for comments. But the commissioner of information during the administration of Mr. Akpabio, Aniekan Umana, described the contents of the petition by Mr. Ekpenyong as falsehood taken too far. He said the petition betrays a lack of understanding of the workings of government. Government and was accommodated in the budget is strange, mischievous and untenable. More so, when one understands that there are checks and balances which guide all aspects of government financial administration,” he said. He also said the allegation that the State Government spent N50 billion on the March General Elections falls flat on its face based on his explanations of the workings of government as regards financial transactions. “There was no such provision in the budget of this year and such an amount could not have been paid as an extra-budgetary expenditure and yet salaries and other commitments were met. We challenge the petitioners to provide proof to support this wild allegation. Who was it paid to? How was it paid? Where was it paid? And when was it paid? “Senator Akpabio does not own a 25-storey building in Victoria Island or in any part of the world, as alleged by the petitioner. It is also a patent falsehood that the house at 22 Probyn Road, Ikoyi belongs to Senator Akpabio. It is a rented building which ownership can be verified from Lagos State Lands Registry. “Senator Akpabio does not own the properties mentioned in the petition to belong to him. You can verify the ownership of the properties (5 Okokosi Close, Maitama and Plot 28 Colorado Close, Maitama) from the land registry in Abuja,” he said. He also denied the state received over N2 trillion as oil allocation. “Please do note that the idea that the Akwa Ibom State Government received over N2.5 trillion in the eight years of the Akpabio administration is an outrageous lie. What this suggests is that the State Government received an average of N26 billion monthly for the period. What a lie! From published accounts of disbursement from the Federation Accounts, Akwa Ibom State never received up to N26 billion in any month throughout the period.